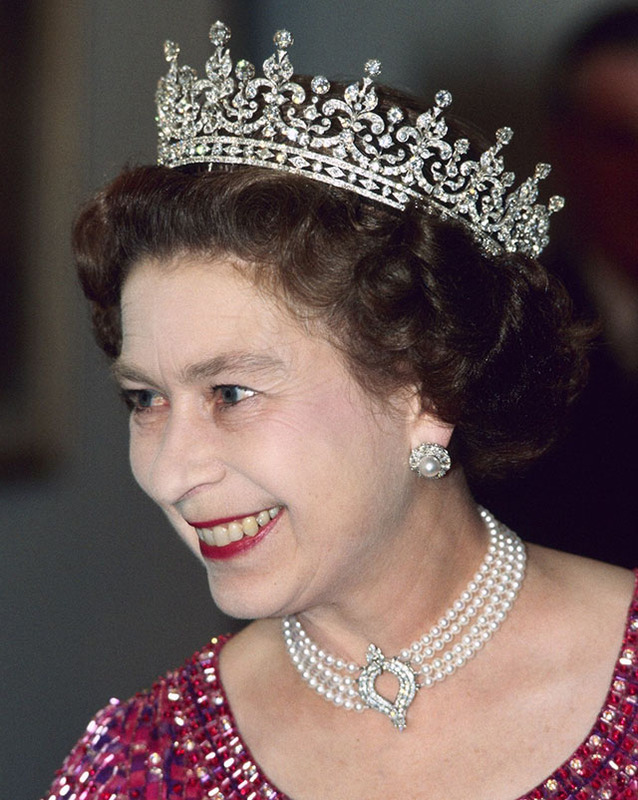 Queen Elizabeth II’s Most Glamorous Jewels and Tiaras Her Majesty’s jewelry box is unmatched. 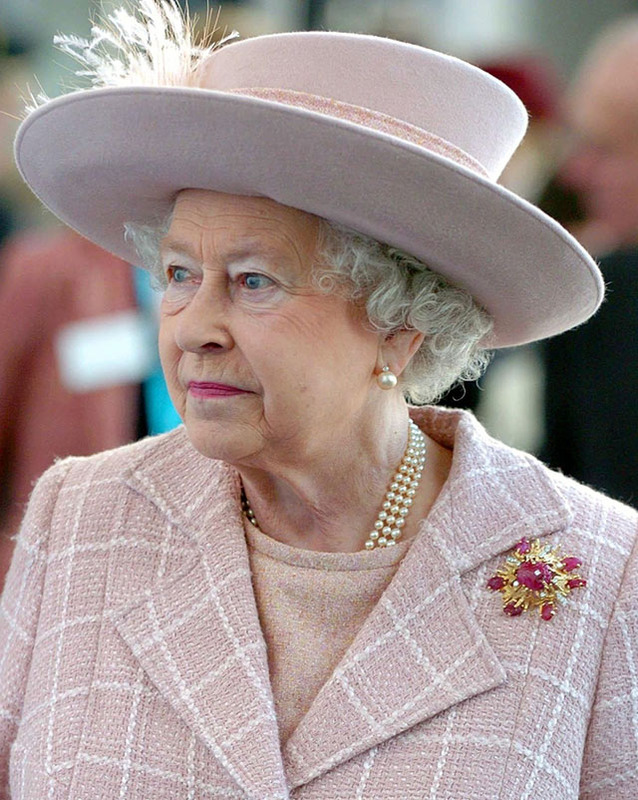 It’s no surprise that in a monarchy over 1,200 years old, Queen Elizabeth would have inherited some extraordinary and priceless pieces of jewelry. While some of her treasures were specially made for her, others were passed through a long line of British monarchs or gifted to her. Here’s a peek inside Her Royal Highness’s peerless jewelry box. 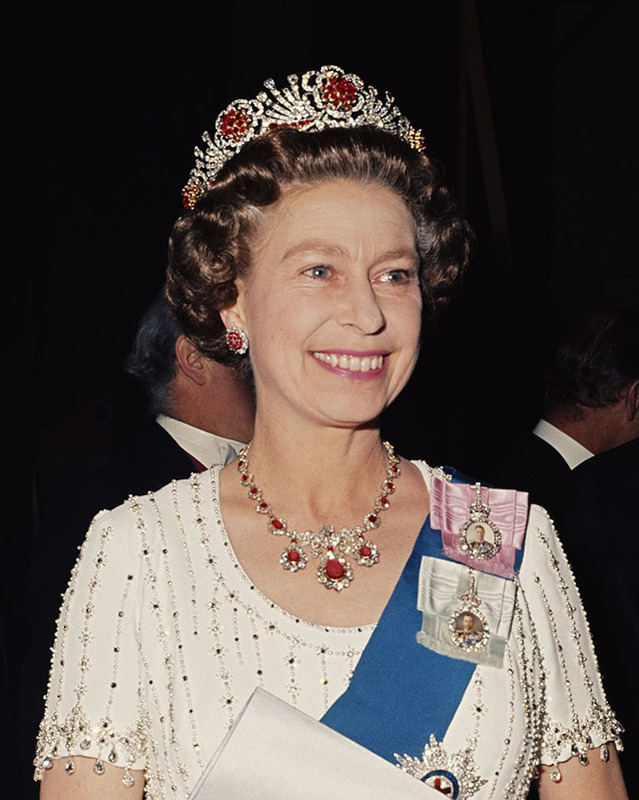 The Queen’s diamond and pearl looped tiara, worn here on May 22, 1978, is known as the Grand Duchess Of Vladimir Of Russia Tiara, and the matching necklace and earrings were originally a gift to Queen Victoria. 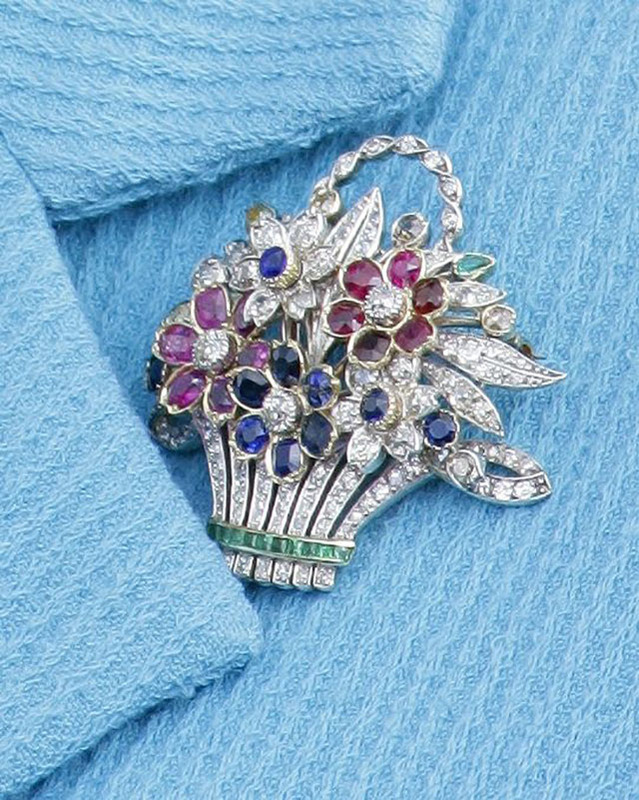 The accompanying brooch, a bow of diamonds with a pearl drop, was given to Queen Mary on her wedding day. 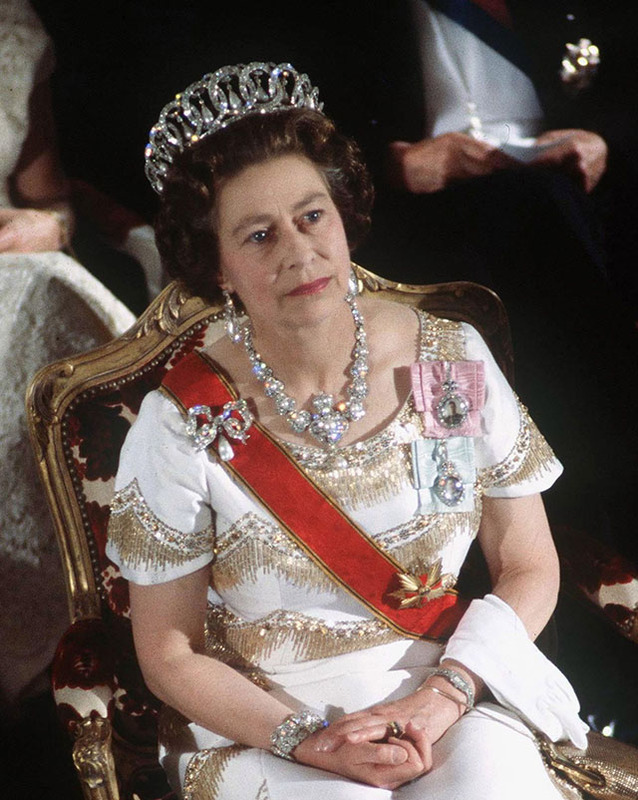 This four-strand pearl choker with a diamond pendant was commissioned for the Queen by the Japanese government in the early 80’s; she’s seen wearing it here on November 16, 1983. It’s been seen on the Duchess of Cambridge as well. 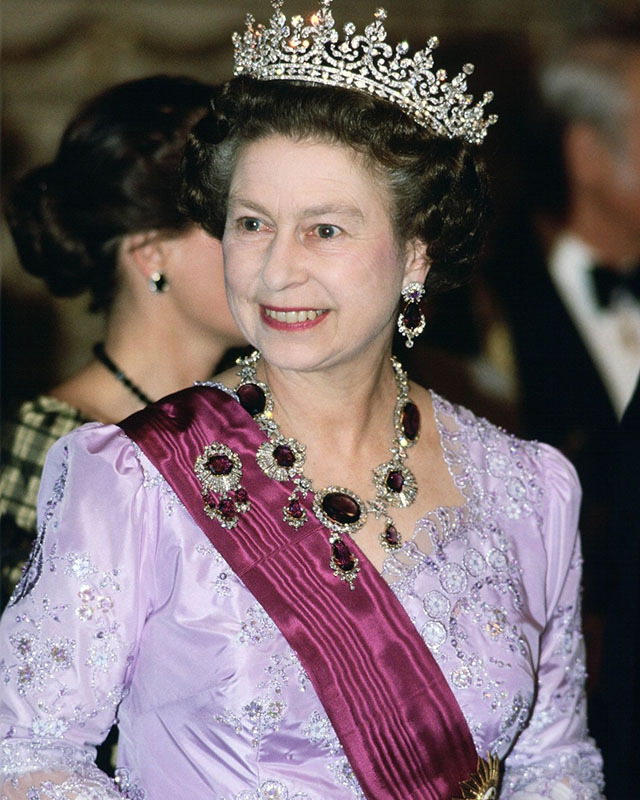 The Queen’s striking amethyst set, which includes a diamond brooch, necklace and earrings, is known as the Crown Amethyst Suite of Jewels and it originally belonged to Queen Victoria’s mother. Elizabeth is seen wearing it here on March 26, 1985. 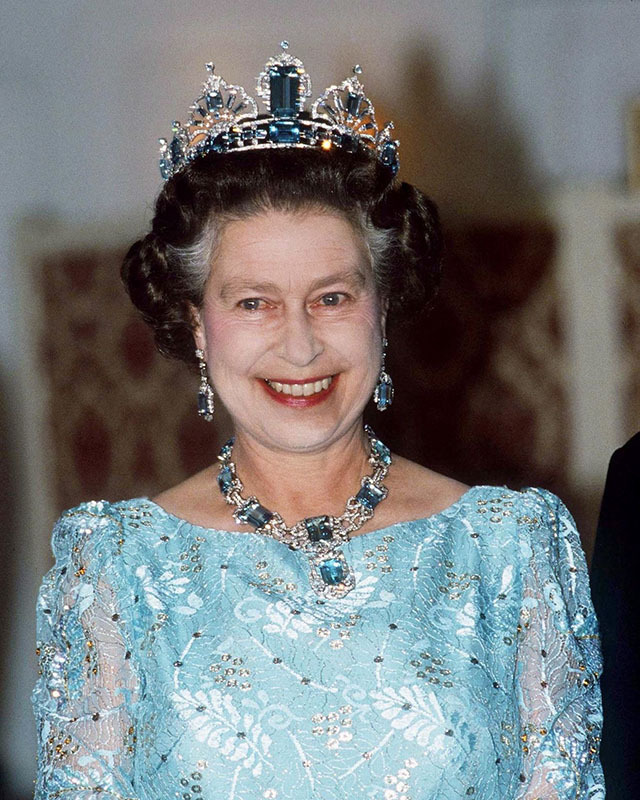 Here the Queen dons a diamond and aquamarine earrings, and necklace set, gifted to her by the People of Brazil for her coronation. Four years later, she commissioned Garrard to make her a tiara that matches nicely. The uprights are apparently detachable and could be used as brooches. She’s seen wearing the set here on October 15, 1986. 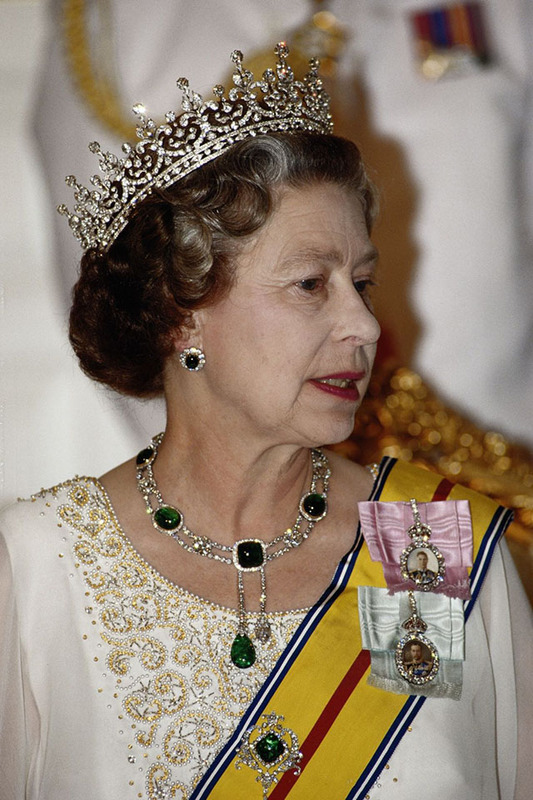 The Queen’s emerald necklace and matching earrings, worn here on October 14, 1989, are known as the Cambridge and Delhi Durbar Parure. The tiara is Queen Mary’s Girls of Ireland Tiara (also known affectionately as “Granny’s Tiara”), which belonged to Elizabeth II’s grandmother, Queen Mary. The tiara originally featured large pearls, which were removed on Queen Mary’s orders and refashioned into the Cambridge Lover’s Knot Tiara, a favorite of both Princess Diana and Katherine, the Duchess of Cambridge. 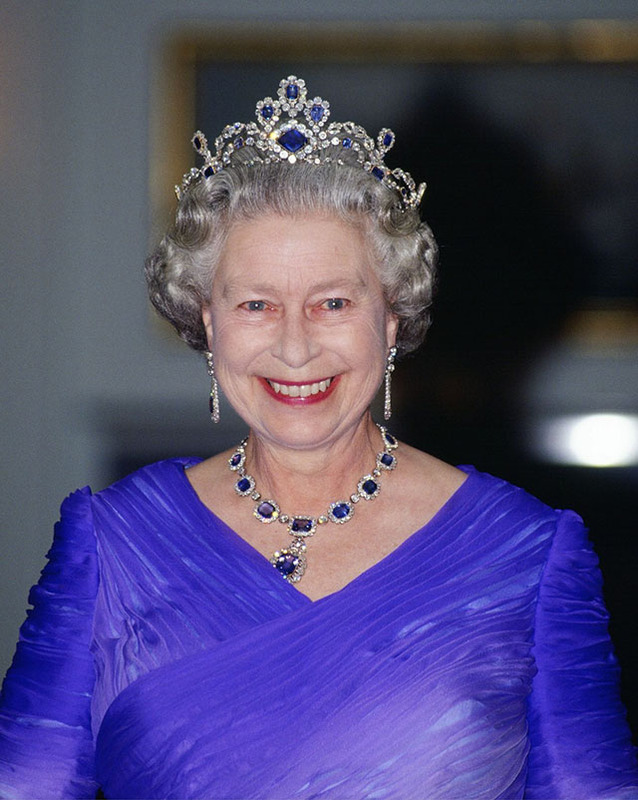 The Queen’s diamond and sapphire necklace and earrings, known fittingly as the Victorian Suite of Sapphire and Diamond set, were made originally in 1850 and gifted to Lilibet by her father, King George VI, for her wedding. 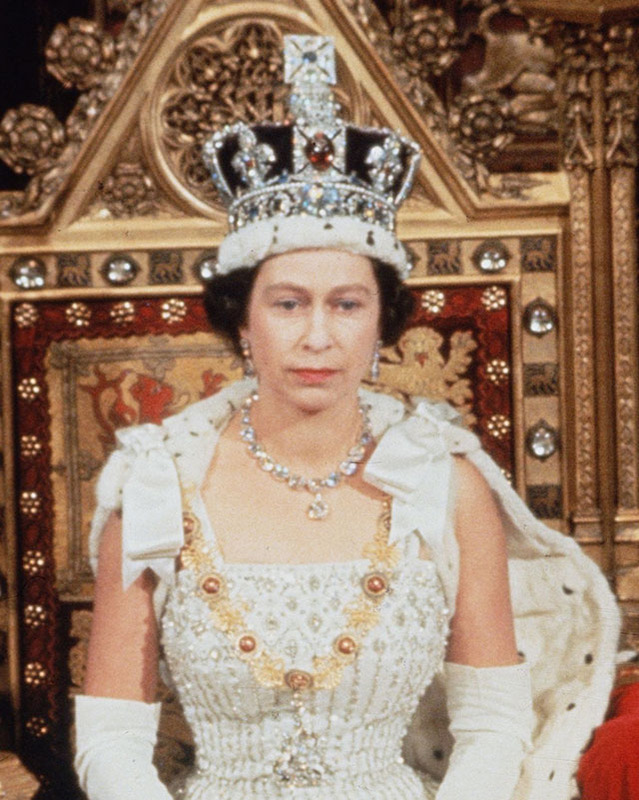 The matching tiara was made in 1963. She’s seen wearing them here on June 11, 1992. 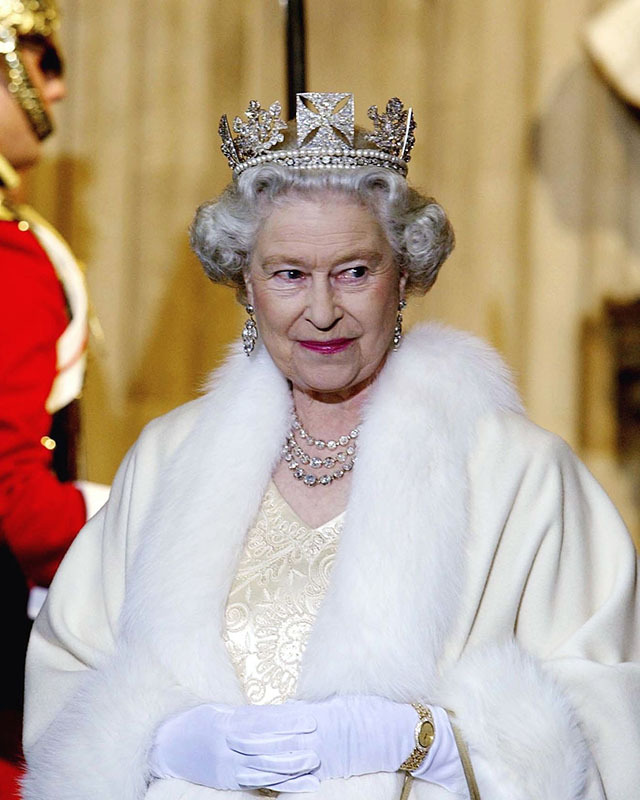 The Queen’s diamond crown, which she’s pictured wearing on November 13, 2002, is known as the State Diadem and was made in 1820 for King George IV, Queen Victoria’s uncle. 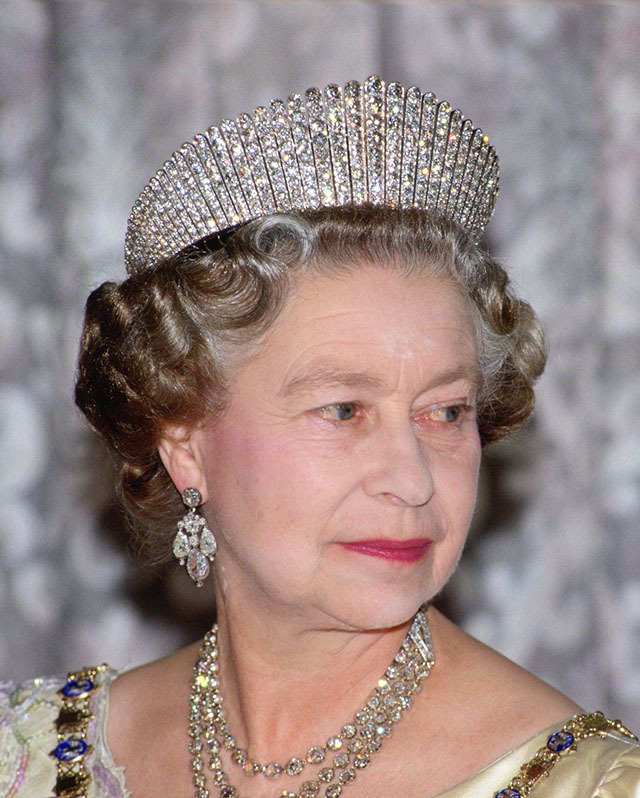 The diadem is traditionally worn by queens and queens consort to the State Openings of Parliament. This yellow gold, ruby, and diamond “Scarab Brooch” is a favorite of the Queen’s and was gifted to her by her husband, Prince Philip, in 1966. The bow-shaped diamond brooch the Queen wore, fittingly, to the 2011 marriage of Kate Middleton and her grandson Prince William, is known as the Lover’s Knot brooch and was part of Queen Mary’s collection. 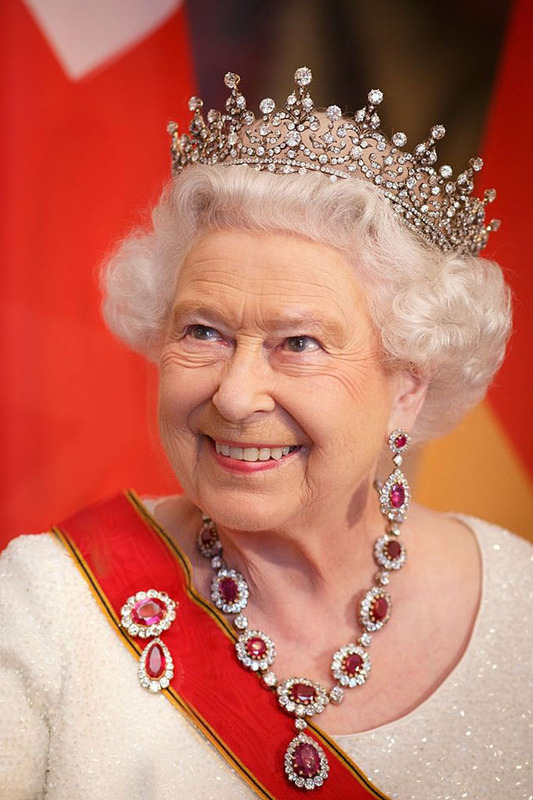 For the Queen’s official visit to Germany on June 24, 2015, she sported the Crown Ruby necklace, designed by Prince Albert for Queen Victoria. 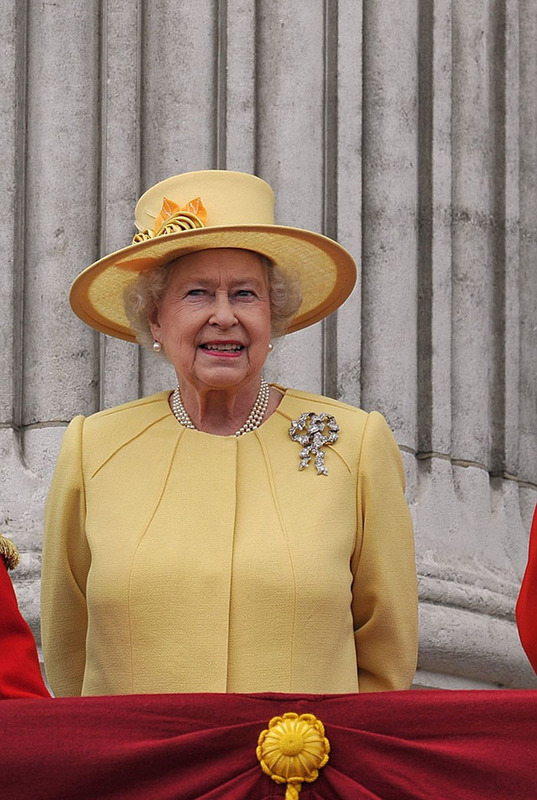 They were part of the Queen Mother’s collection until her death in 2002. 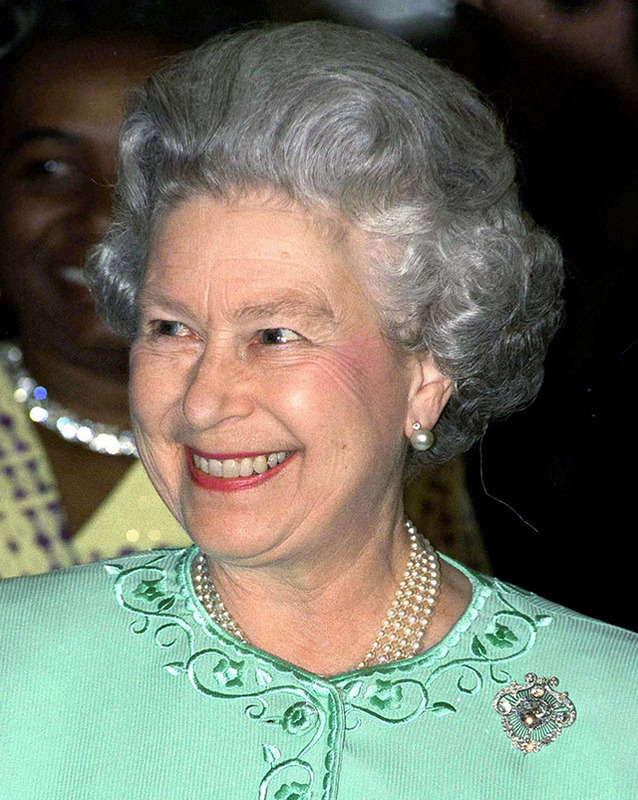 This three-strand pearl necklace must be a favorite of the Queen’s as she wears infrequently. 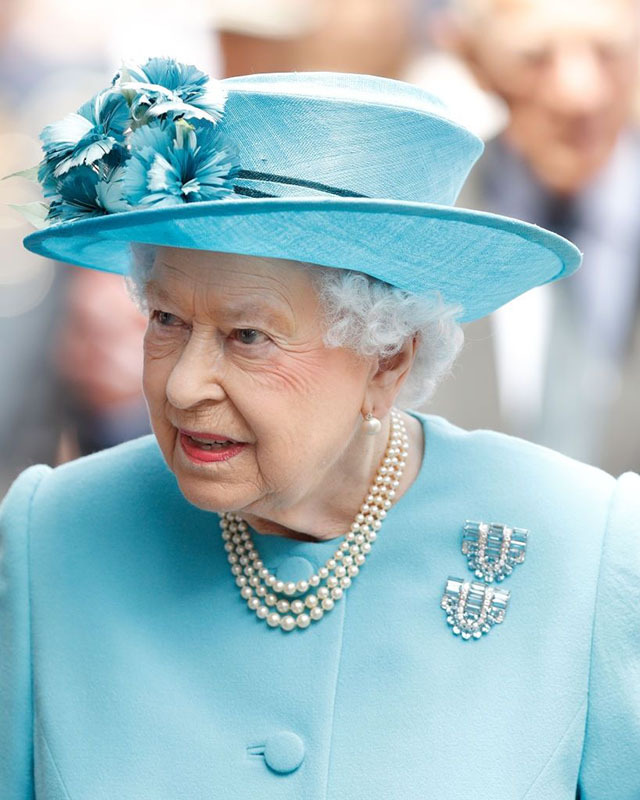 Perhaps it is a go-to for the Queen because it was gifted to her by her father, King George VI, or because it is an elegant and simple piece that can be worn with many other jewels. Read original article from Town and Country.